One of my favourite non-fiction books is Dan Pink's Drive. It's a cogent, convincing and convention-challenging argument about the limitation of money in driving performance and satisfaction in the workplace, and how what really motivates us is autonomy (the ability to make decisions that can make a difference), mastery (how people can be rewarded for progress, and getting better and better at what they do), and purpose (working towards a vision or purpose that is important to us). Intuitively this makes a whole bunch of sense, but Pink supports his arguements with plenty of studies and research. So given how critical staff performance and motivation is to organisational performance, it seems strange that in most companies, so few organisational constructs are focused around these principles. Survey after depressing survey reveals a disturbing picture about how few of us are genuinely happy in our jobs. The latest one I saw was from Gallup who had surveyed 230,000 workers from 142 countries and found that only 13% of workers feel engaged by their jobs (feel a deep connection to their company and what they are doing), 63% are 'not engaged' (unhappy but not drastically so, but putting little energy in), and 24% are 'actively disengaged' (fundamentally dislike their jobs, and even seek to undermine what others are doing). It's a bleak, disheartening picture. So I have a controversial theory. What if we took those fundamental principles about what really makes people productive and happy in their work, and put them at the centre of everything? What if we organised not just incentives around them, but the way in which we map organisational strategy to output, the way that we structure our teams, the way in which people work every day. Let me give you some examples. Take autonomy. One of the fundmental tenets of agile thinking is self-organising teams. I've written before about engineering or tech driven cultures (such as that at Facebook) where rather than having a strictly top-down, hierarchical organisation of activity, the engineers decide what they want to work on and the Project Managers have to lobby groups of engineers to get them excited about their idea. This ensures a combination of top-down organisational strategy with bottom-up self-organisation which is both empowering and (I'm guessing) highly motivating. It's interesting to consider what will happen when more of that kind of empowerment through autonomy migrates out of tech teams and into the wider organisation (something which is already happening in some enlightened organisations I've spoken to). Such cultures are also good at helping everyone feel responsibility for the product or end result, and the impact that activity can have on end result, which brings me onto my second example - mastery. The organisation of activity around small, nimble, multi-disciplinary teams that are focused on completing specific projects is not only empowering, but supportive, motivating, productive, and agile. Combine this with a high level of data transparency (including commercial numbers) that enables staff to see the direct impact of their efforts, and their improvements over time, and you really have something. In this TEDX talk Dan Ariely (Psychologist, Behavioural Economist, Author of Predictably Irrational and others) talks about how people understand the importance of meaning but underestimate the magnitude of importance. And I think that's what companies do too. He ends with a fascinating point comparing Adam Smith's thinking (characterised by an industrial revolution type of repeatability, efficiency, a singular focus to tasks) with that of Karl Marx (the alienation of labour, how people need to feel the meaning in their work, how they think about the connection to what they're doing, and the outcome). In the industrial revolution, says Ariely, Adam Smith was more correct than Karl Marx, but now that we have switched to the knowledge economy, efficiency is no longer more important than meaning. As we move toward a situation where people have to decide on their own how much they care about or feel connected to their work, and what attention they pay to it, purpose becomes fundamental to success. 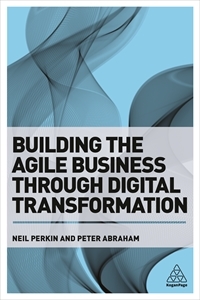 All of this emphasises (again) how becoming more agile as an organisation is not only about technology and processes, but about people and culture.